A while ago I posted that I had a quilt that I assumed was a shoo-in for QuiltCon that didn’t get accepted. This is that quilt. I finished this over a year ago, but it was slated to be the cover model for the book-that-didn’t-happen, so it didn’t get shared back then. Because it was going to be the cover model for my book, I decided to have the incredibly gifted Karlee Porter do the quilting. I think I like the quilting more than the quilt itself! I made the back a medium grey just so it would show off the quilting better. 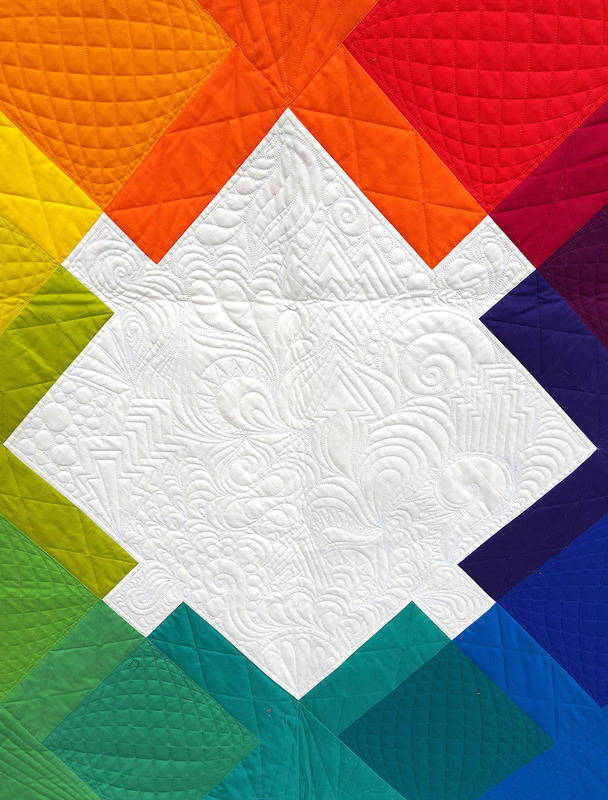 It may be hard to believe, but this quilt is based on this QDAD design. 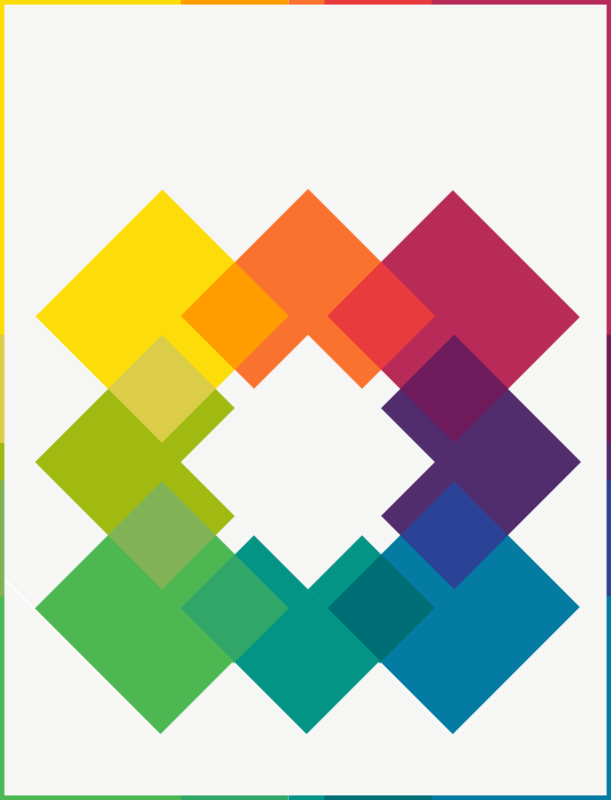 Instead of doing 3 colors, I went full rainbow, took out the center area, but kept the transparency. Because I finished this so long ago, I don’t really remember what I had to say about it. Other than it took 3 hours and at least 60 bolts of Kona being pulled at my local quilt shop before I was happy with the color selection. And I still ended up subbing one color out for another before it was done. I also spent a lot of time on the binding, and I actually really dislike it. 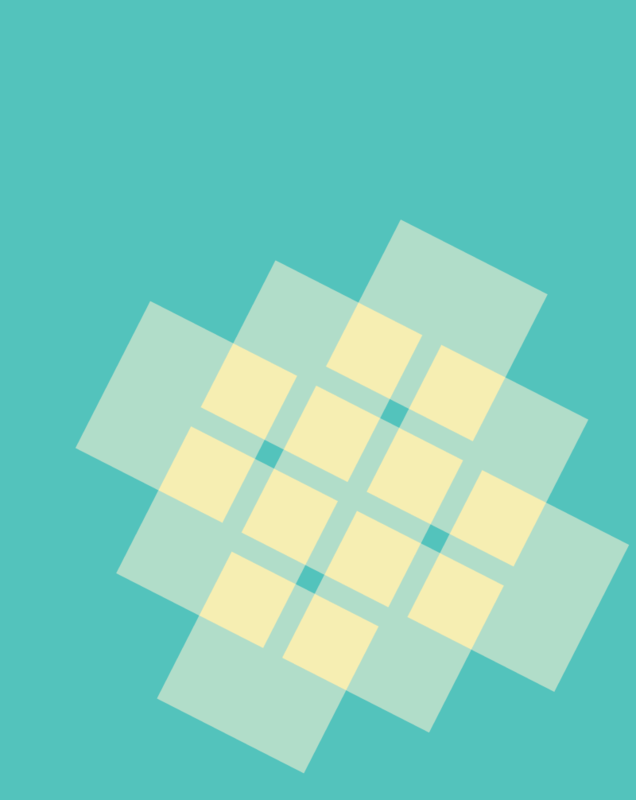 I know some people will probably enjoy it, but it feels a little heavy handed and I wish I’d just gone with white and maybe a pop of color somewhere along the way. If I cared enough I’d pull it and replace it, but I’m pretty sure I don’t care enough. Too many new projects going on that I’m far more excited about! The good news is that this quilt was selected (along with Transcendence) to be shown at the AQS show in Grand Rapids, MI. It was accepted into the long-arm quilting category, so really it’s Karlee who got into the show. But I’m glad I’m along for the ride! Thing I learned: Don’t photograph your quilts outside right after the lawn mowers have been by when it has also recently rained. Especially when your quilt is longer than your quilt hangin’ tree is tall. Other thing I learned: Alcohol does a fairly good job of removing small grass stains. Thank you, Cathy! Gorgeous, Anne! I really love it! Whoa! This is so striking, Anne! What a story this quilt has. I wish it the best in Grand Rapids! I love transparency effect. This is perfect! 🙂 Love it and totally understand the hours spent by choosing the right colors. I love it. It is such a happy quilt and the quilting is amazing. Thanks so much! Karlee did a fantastic job on the quilting. I keep finding new things hidden in there! I find it hard to believe that any big Modern show would not want this quilt included. Thanks so much for showing us this, as people have a hard time with rejection, myself included. Thank you for the kind comments! My guess is that a juror or two were “over that rainbow thing.” Which is totally fine. 🙂 I have had plenty of things rejected at this point, which makes it easier to get over although it still always stings a little bit when the decision first comes down! You are right the quilting is amazing! But it wouldn’t be if it didn’t have your beautiful ‘canvas’ to paint on. Your design is beautiful, rainbow or not. 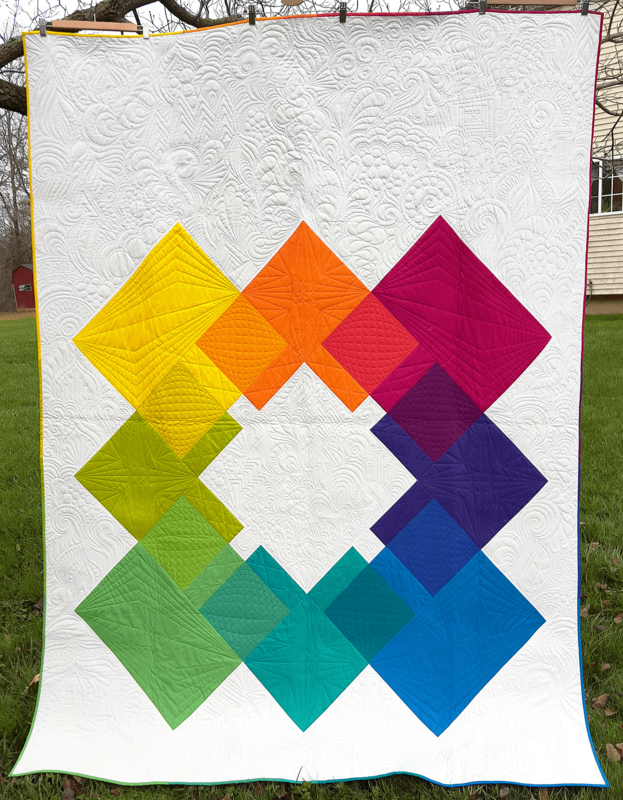 I think the QDAD design is fascinating and would love to see it in a three color quilt! I appreciate all the time you took picking the exact right colors…you maniac! Thank you Jayne! 😀 My aesthetic has shifted pretty strongly since my “QDAD phase” (hahaha omg I’ve been quilting long enough to have phases!) so I don’t know if I’ll ever revisit it at this point. But who knows, this stuff seems to trickle into my work one way or another! 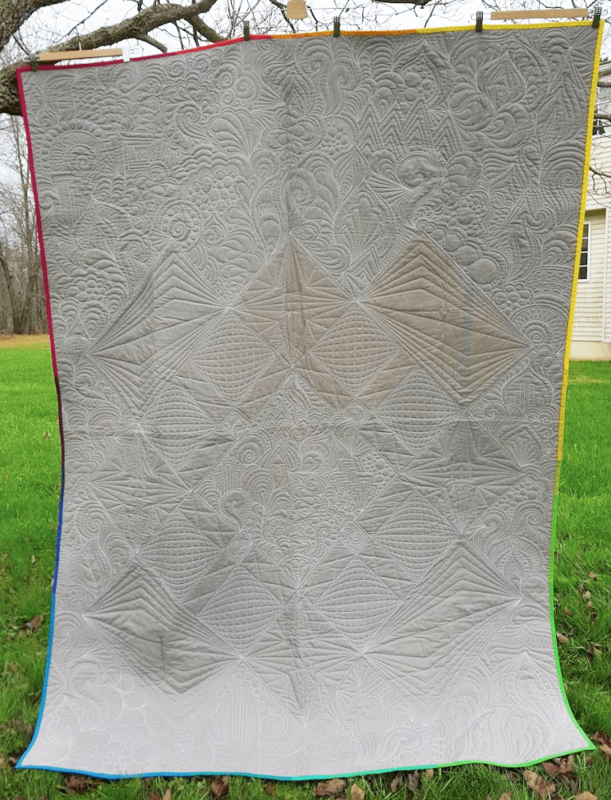 Zowie — what a beautiful quilt! It’s just lovely! You always have the most thoughtful comments, Yvonne! 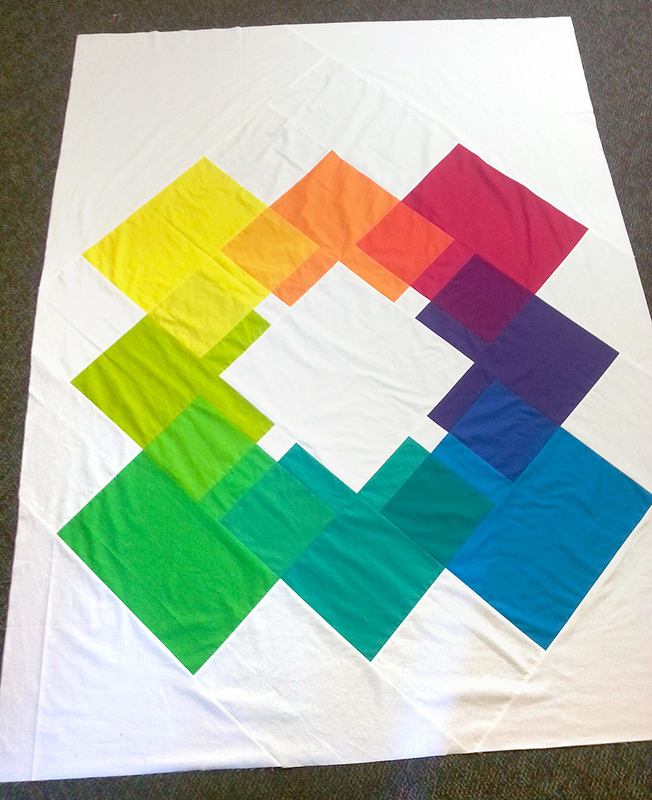 <3 The nice thing about my "QDAD phase" is that most of the quilts were really quick to put together. My current phase seems to be a LOT slower. So I still don't have any finished quilts. And really only have 2 in progress. So many more experiments I want to try!! I think I need way more time in my day! This is amazing! I love the colors and the transparency and the negative space and the quilting and everything about this (binding too, though I think going white with it like you mention in the post would be lovely also). Hooray for you! Well I love it!! Good luck to you and Karlee in Grand Rapids! Because the center of the quilt is so vibrant I think the edge would have faded off to oblivion if it had also been white. the choice of repeating the rainbow on the edge is wonderful. all in all a stunning piece. Thank you so much, Cathy! And you might be right about the white being too bland around the edges. I hadn’t really considered that! I always appreciate your design aesthetic and viewpoint on your projects, Anne. This is one that you should certainly be proud of, binding and all! Though there is actually something about the center area of the quilt and the sharpness of the color corners there that truly draw me in! Thanks for sharing its story! Love this quilt!!!. Also did you get judged feedback from the AQS show?